The Boston City Council was sworn in Monday at Faneuil Hall. The Boston City Council voted unanimously Monday to elect Michelle Wu as its president, making her the first Asian-American and the first woman of color in history to lead the body. The 30-year-old Roslindale lawyer ascended to the rostrum after serving a single term on the City Council and will be the youngest president in decades. Wu outmaneuvered several of her more-experienced colleagues as she secured votes to lead the body for the next two years. Wu said the council would work with Mayor Martin J. Walsh to reduce income inequality, reform the criminal justice system, improve schools, and prepare the city for climate change. Michelle Wu’s ascendancy to president of the Boston City Council is a turning point. To accomplish her goals, Wu said the council would launch a new committee to focus on homelessness, mental health, and addiction. Another new committee will tackle jobs, wages, and workforce development. She vowed to expand the Public Safety Committee to include criminal justice. Wu also pledged to increase transparency and accessibility by revamping the council’s website to make it easier to track and understand legislation and hearings. Councilors will hold town meetings in Boston neighborhoods, she said, to hone the focus of City Council committees. The City Council presidency is a largely ceremonial post that does not include strict control over the council’s legislative agenda the way the speaker rules the Massachusetts House of Representatives. The position does come with some additional power, a larger staff budget, and duties that include serving as mayor if the job becomes vacant or if the mayor is unable to serve. As mayor, Walsh made a rare appearance Monday before the City Council to congratulate Wu on her election. 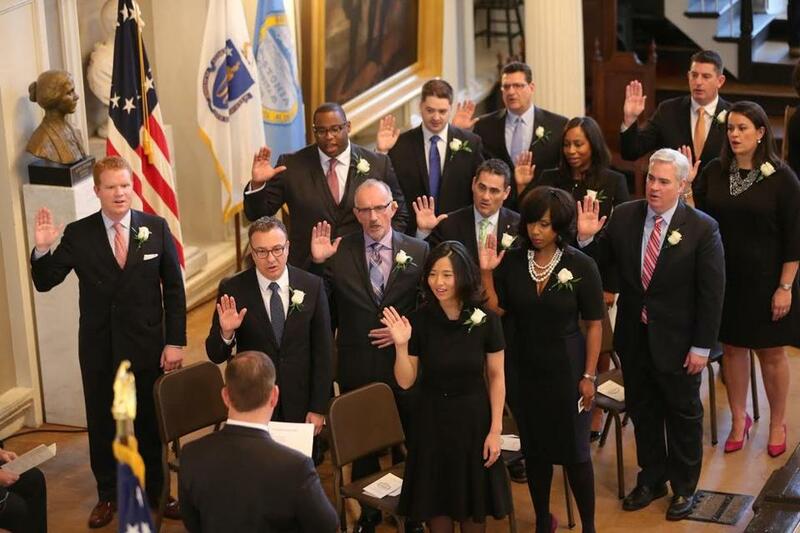 Earlier in the day, Walsh administered the oath of office to the 13-member body, which included newcomers Annissa Essaibi George and Andrea Joy Campbell. Councilors took the oath during a brief ceremony at Faneuil Hall, where family members and political supporters cheered. Essaibi George, who won an at-large seat representing the entire city, kept one eye on her four boys as she stood for media interviews. Andrew Ryan can be reached at andrew.ryan@globe.com. Follow him on Twitter @globeandrewryan.